This is a sponsored post written by me on behalf of KitchenAid. As always, all opinions are my own. 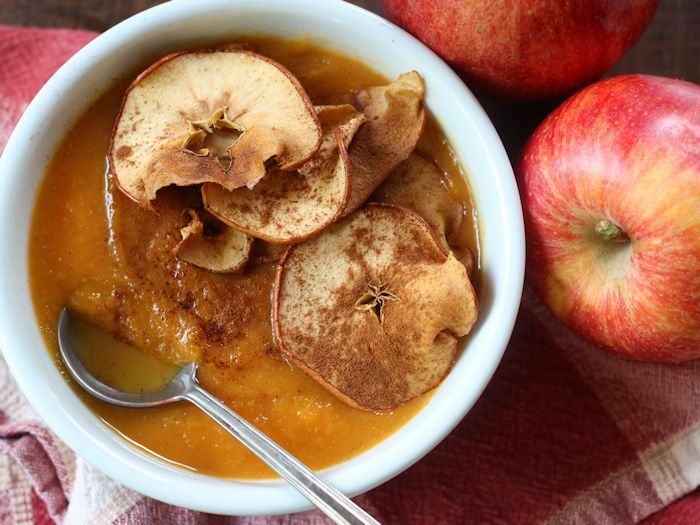 Sweet-tart apples and creamy sweet potatoes are blended up with warming spices to make this cozy sweet potato soup that’s topped with baked apple chips! Can you tell I’m excited for fall? It’s just September, and here I am, ready to cozy up with a bowl of this yummy goodness. I know, I know. Lots of you guys aren’t quite with me on this, at least as far as cooling temperatures are concerned. I think we can all at least agree that September apples are a good thing, right? I always get super excited when I start spotting big bins of every colored apple at the supermarket and farmers’ markets. 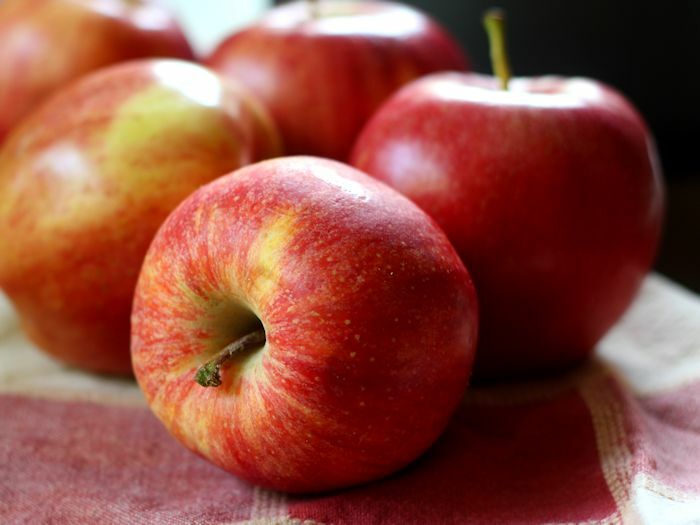 While you can get apples any time of year, they’re always awesome and abundant in early fall. And it isn’t even chilly out yet. I think this is a win-win for all of us. One thing I love about apples is how they work well in both sweet and savory dishes, and this dish is indeed both sweet and savory. 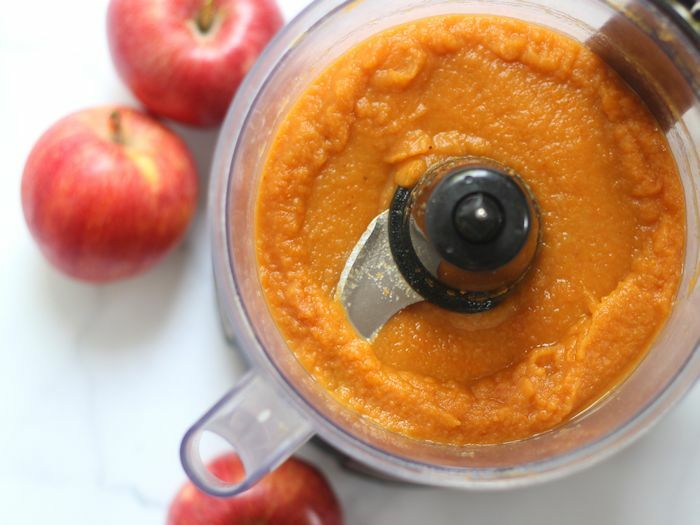 I also love the flavors of chai tea (but you probably already knew that), so I figured why not use them to season up some creamy sweet potato and appley bisque? If you’ve got some apple creativity up your own sleeve, you’ll want to check out KitchenAid’s Apple Challenge. Come up with a super creative, super delicious recipe featuring apples and enter through Twitter or Instagram with #KitchenAidContest or here. Four finalists will fly to New York for a live cook-off, and one winner will receive a set of KitchenAid Black Stainless Steel Appliances and a private cooking lesson with Chef Geoffrey Zakarian (jealous and jealouser). Preheat oven to 225° and line 2 baking sheets with parchment. Using a very sharp knife or mandoline slicer, slice apples very thin. Remove any seeds. 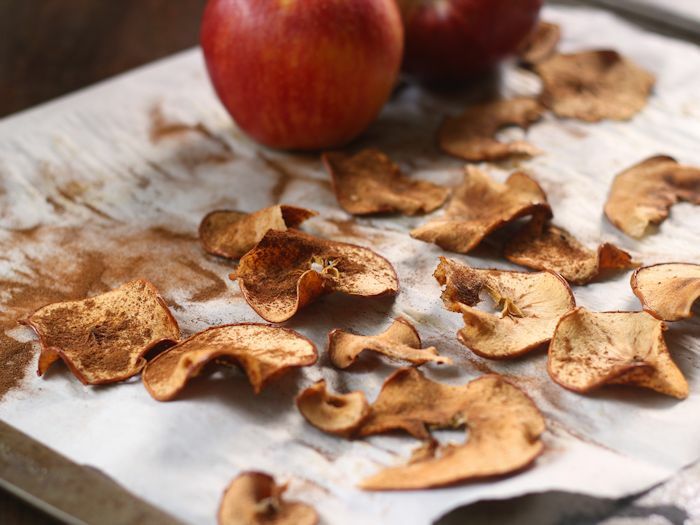 Arrange slices in a single layer on baking sheets and sprinkle with cinnamon. Bake 2 hours, flipping halfway through. Remove from oven and transfer to cooling rack to cool. When the apple chips are almost finished baking, coat the bottom of a large pot with olive oil and place over medium heat. Add onion and sauté until softened, 5 minutes. Add garlic and fresh ginger and sauté 1 minute more. Add broth, apples and sweet potatoes. Raise heat to high and bring to a boil. Lower heat and simmer until sweet potatoes are very soft, about 15 minutes. Working in batches if needed, transfer mixture to a food processor and blend until smooth. Return mixture to pot and add maple syrup, cider vinegar, cinnamon, ginger, black pepper, cloves, cardamom and salt. Stir to incorporate. Thin with additional broth if needed. Place over medium heat and cook just until reheated throughout. 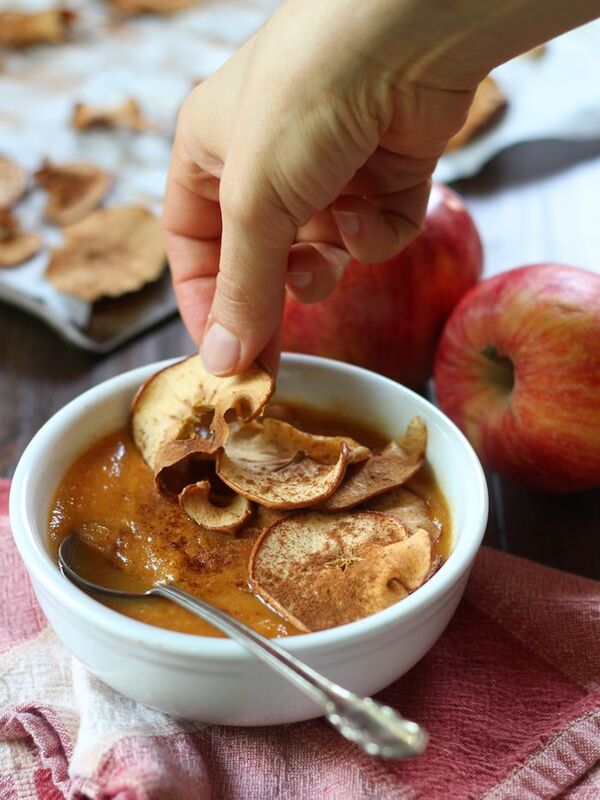 Divide soup into bowls and top with apple chips. Serve.